BUSHWICK — A series of plays written by Bushwick fifth graders will be performed by professional actors this Saturday and Sunday. 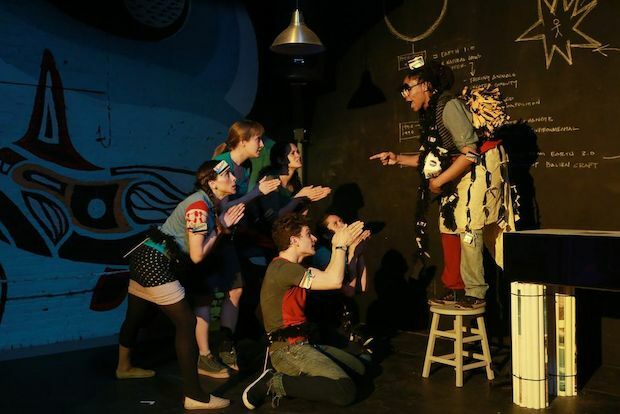 The show is the culmination of the Big Green Theater Festival, a program that works with Bushwick students to write and stage environmentally-themed plays. The 11 students in the program met three days a week after school for the past three months to talk to environmental experts and write plays based on the issues they discussed. “The kids are getting exposed to topics and people that I know I was never exposed to,” said Jeremy Pickard, the program’s lead teaching artist and production director. “It’s a life-changing experience to see your words performed by professional actors onstage,” he added. The festival is a collaboration between the Bushwick Starr theater and the Superhero Clubhouse, a collective of artists and environmental advocates that work to inspire environmental conversations through theater. The program, which works with a small group of fifth graders at P.S. 123, is now in its fourth year. Noel Allain, the artistic director at the Starr, helped create the program. He said he hopes it will help the theater connect with audiences that wouldn’t ordinarily buy tickets for its shows. “We would like to continue a relationship with the families that live here, so they feel like this is a place that’s also for them, that provides something for all the communities that live in the neighborhood,” he said. This year, the program received a grant that allowed Pickard to meet more frequently with students and hire additional staff members. In the past, students met only twice a week, with shorter sessions. “The plays this year are more complete than ever before, and in some ways more complex than we’ve worked with in the past, because we had more time,” Pickard said. The plays, which are each five to 10 minutes long, are performed together, linked through a central narrative in which the actors are exploring a museum of artifacts from a parallel world, and learning the story behind each item. Allain said having adult actors perform the scripts allows the students to see the full potential of their plays. “It helps them see how their writing can really bloom in a real rehearsal process,” he said. Pickard explained that both the content of the plays and the show’s production are green — costumes are made from recycled clothing, paint is repurposed and all the lighting is LED or florescent. He said the total electricity used to put on the show is equal to that generated by one traditional stage light. Pickard added, however, that not all the plays contain overt environmental teachings. “The only rule when they’re writing their plays is that the conflicts of their plays must be inspired by the presentation,” he said, referring to the five guest lecturers who came in to teach the students about environmental themes. “It’s ultimately about their creativity and expression, so how much this information influences their plays varies from year to year,” he said. Pickard explained that two of the plays are based on a lecture the students heard about bee colony collapse disorder, in which portions of a colony’s population disappears — though the students' end results are quite different. In one of the plays, two bees whose colony has been wiped out go on strike to get the attention of the farmers, who have been spraying the crops with pesticides. In the other, a nerdy alien boy abducts a queen bee and brings her colony to his spaceship, where they throw a party in order to impress an alien girl. “Fifth graders are kind of just mad brilliant geniuses inside,” Pickard said of the students’ creativity. “Our hope is that if we can get the resources and continue to be lucky in getting funding, to expand the program to work with another school so that the festival would really become a festival,” he added.